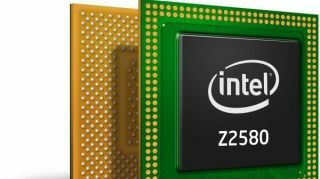 Discussed briefly at CES 2013, Intel's Clover Trail+ dual-core processor (Z2580) was revealed as the next step in the company's Atom smartphone chips. A direct successor to the 32nm Medfield line of processors, the Clover Trail+ adds a second CPU core to the chip, improving graphics and performance along the way. The Clover Trail+ will be released as three new SKUs - the 2.0GHz Z2580, the 1.6GHz Z2560, and the 1.2GHz Z2520. Each of the chips will also include two PowerVR SGX 544MP2 GPUs, and combined with the above benchmarks, should equate to more competitive performance, though the battery life still won't be as impressive as some smaller processors. The upgrades the Clover Trail+ presents aren't just limited to performance, as it also allows for more hardware improvements. The latest Atom chips will include support for two cameras, with the primary lens able to capture up to 16MP images, and the second camera supported up to 2MP. Shooting in HDR will also be slightly better with the new Clover Trail+, as blur and ghosting will be reduced thanks to almost entirely re-written firmware. That same new firmware also adds the ability to select headshots from multiple takes of the same photo so you can create single images where everyone is more photogenic. The GPU will provide support for screen resolution up to 1920 x 1200, which should bolster support for Intel's chip in new tablets, as well as smartphones. Even though Intel has also updated the silicon in the chips to XMM 6360, which provides HSPA+ antenna capabilities, the company still hasn't made the jump to LTE-friendly silicon. The XMM 6360 includes a pentaband transceiver, and features 42Mbps DC-HSPA+ support, as well as 11.5 Mbps HSUPA support. Intel did promise actual LTE support by the end of 2013 via its Bay Trail processors, but those aren't expected until the holiday season. While the Lenovo IdeaPhone K900 and Motorola Razr i are already on board to support the new Intel processors, Intel is still lacking that major name to help it overtake rivals like Qualcom and ARM. The Clover Trail+ appears to be a strong effort from the manufacturer, but only time, and supporting smartphone and tablet companies, will tell if Intel can match up with more established chips from competitors.